Have you heard of a popular casino poker game, known as three card poker? Sure you have, it’s actually one of the most popular poker games that are played against the house. ”Trey” is an expression used for the amount of cards featured in this game – three. The game is quite similar to Caribbean Stud in terms of how hands are made and payouts earned. However, the obvious difference in Trey Poker is that only 3 cards are dealt to both, player and the dealer. The hand combinations, while holding the same titles and meaning, are made only out of three cards. You can hold a flush, if all three cards in your hand are of the same suit as well as make a straight, when three consecutive cards are dealt – such as 5, 6, 7 for example. This game is available at all Net Entertainment powered casinos, such as Mr Green, Casino Luck and Come On Casino. Trey Poker, while a highly unique game, also features a couple of aspects that could be considered as ”standard” ones. One of these is types of wagers that can be made and some that have to be made in order to play. Ante Bet is a common bet type in most casino poker variations, same for this one. You’ll have to make it, if you want to participate and see any cards dealt. Once placed, click on the ”deal button” and 3 cards will be dealt to you. Play Bet includes a decision making. Is your hand good enough to try and compete with the dealers? If not, you can always just ”fold” and give up your ante bet, while not risking any additional cash on top. You can earn up to 100 to 1 payout, if you make a Royal Flush and dealer qualifies! Pair Up is a sidebet that can be made if you, for some reason, are convinced that the very next hand dealt to you will be equal or better than a pair. A payout as high as 5 to 1 can be earned on this one. Poker games, at least those that are played against casinos, seem to have a rule stating that dealers hand has to qualify, in order for any big payouts at increased odds to be awarded. This is also the case with Trey Poker – dealer has to hold a qualifying hand, otherwise your ”Play Bet” is not awarded with a payout at all and is considered as ”pushed”. So how does dealer qualifies? It’s quite simple actually – whenever dealer gets a hand that is equal or better than high card with a queen, his hand is considered as a qualifying one. Here are the payouts that are awarded to your ”Ante Bet”, given that dealer holds a qualifying hand (see the rules above). Note that these payouts are on top of the regular ones, which are even money (1 to 1), if you hold a better hand than dealer. There also are additional payouts for the ”Pair Up” side bet and these are even more lucrative. Payouts as high as 100 to 1 can be earned. So there are a couple of possible scenarios with the ante/play bet. Note that ”Pair Up” is a completely independent wager and only based on the strength of your hand. Dealer can beat you, but if you hold a pair or better, payout will be awarded anyway. That’s not the case with the other two wagers though. Dealer does not qualify – you earn an even money payout on the ”ante” bet, while ”play” bet is pushed. Dealer qualifies, but you hold a better hand – both of your bets are paid at even money odds. Dealer qualifies, but his hand is equal to yours – both bets are pushed (neither won, neither lost). Dealer qualifies and has a better hand than yours – all your bets are lost. The only exception is that you have wagered on the ”Pair Up” bet and hold at least a pair, in which case payouts are awarded according to the paytable. You should always call aka ”play”, when holding at least queen high or better. Why? It’s quite simple – dealer qualifies with Queen high, which means you’ll often beat him and get a payout on both ”ante” and ”play” bets. It’s not all that easy to make a hand using only three cards, as you might imagine, thus a high card will often win it for you! Other than that, you should avoid betting on the ”Pair Up”, unless you’re one of those players who can’t live without maximum amount of action. The payouts are quite small at this bet, compared to the frequency in whom you’ll make at least a pair with only 3 cards dealt. 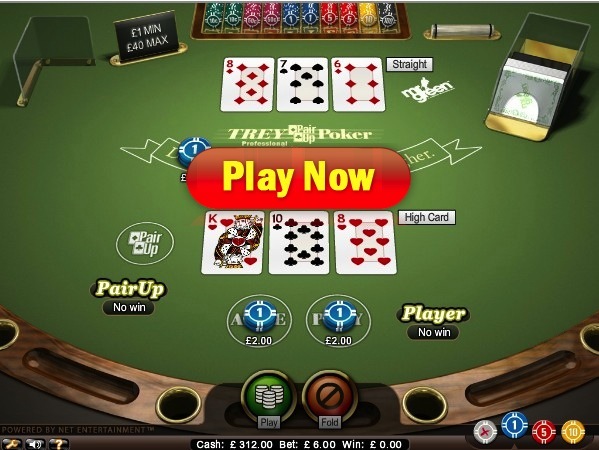 Now you are all set for enjoying a great Trey Poker playing experience in an online environment. I would advise you to play this game at Mr Green Casino that is known for extraordinary games, customer satisfaction and well, their design. Join now and claim a $200 Welcome Bonus + Free Spins on various slot machine games! Click Here to Visit Mr Green Casino Now!